Learn yoga basics with expert guidance in this introductory beginners yoga course. The Basic Beginner Course II is the second part of the four-part Yoga Selection online beginners program. Progress from beginner to intermediate in 18 video classes. The Yoga Selection beginners program is the most comprehensive and structured beginners program available online. It will help you to build a safe and solid foundation for your yoga practice. Once you complete the four-part beginner program you are then ready to progress to intermediate level classes. These next five classes will complete your basic introduction to yoga and take you through to the next stage of your journey. You will be exploring new twisting poses, balancing in new standing poses and building abdominal strength. To start feeling more of the benefits of yoga it will be important to try and practice regularly. This will help you to build momentum and progressively challenge yourself. Pushing too hard and feeling constantly out of your comfort zone is not likely to lead to a positive experience. Equally, it will be hard to experience any benefits from your practice if you are never out of your comfort zone. This course is designed to help you find the right balance to confidently progress. Ideally, complete the Basic Beginner Course (part I) prior to commencing this course. How will learning yoga help me? People try yoga for varying reasons. You might be looking for relief from back pain or some other discomfort. Perhaps you are interested in sport and want to improve your performance or minimise your injury risk. Maybe you need a tool to manage stress. These are all good reasons to give yoga a try. As you work your way through this course, you may start to notice yourself feeling stronger, more flexible, more energetic and less stressed. Your concentration may be more sustained. You might start to notice yourself being naturally drawn towards food, situations and people that are good for you. All of these benefits will naturally start to follow the more you practice. To find out more about learning Iyengar yoga online as a beginner, see our blog article. Focus: This class contains all the standing poses that you worked with in the previous course. You will be staying a bit longer in poses now. This is in part due to the fact that you are stronger, but also because you need that bit longer to apply your growing knowledge to each pose. This class introduces some fundamental concepts about how to twist in yoga poses. New twisting movements are explored in both standing and seated positions. 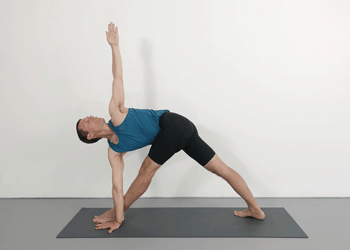 Key Poses: Parivrtta Trikonasana (twisted triangle pose) and simple cross-leg twist. Focus: By this stage you may be noticing an improvement in your hip mobility. Up until this point, hip work has mainly taken place in standing positions. 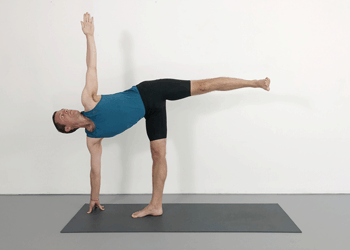 In this class you will further develop this with the standing pose Ardha Chandrasana (Half Moon Pose). Then start to explore hip work via a new seated pose. The basic techniques of standing and seated twists are further consolidated. Key Poses: Ardha Chandrasana and Gomukhasana preparation. Focus: Your overall posture by this stage, has likely begun to improve. Having stronger leg muscles, and more open hips and shoulders helps to achieve this. Notice how having stronger legs starts to make you lower back feel more supported in the coming weeks. A group of leg strengthening poses are included in this sequence. This class also looks at techniques for improving Adho Mukha Svanasana (Downward Facing Dog Pose). Start to feel the rejuvenating effect of elevating your legs and relaxing at the end of each class. Focus: This class devotes more time to seated poses. A sound understanding of these basic seated poses will effortlessly lead you towards some of the more advanced seated poses at a later stage. In this class you will be working with new seated poses that help bring mobility to the hips, knees and ankles. Some abdominal strengthening poses enter the course in this class. The standing twist parivrtta trikonasana is also explored more closely. Key Poses: Parivrtta Trikonasana, Baddha Konasana and Janu Sirsasana. Focus: This final class will give you a taste of what to expect from the next course – The Beginner Extension Course. You will be introduced to new inverted poses which are practiced regularly in the next level. These poses incorporate upper body strength with shoulder and wrist mobility. The expectation is that these poses will be fun but challenging when first encountered. At this stage familiarity is all that is necessary. The poses are developed more fully down the track. As many poses as possible from the Basic Beginner Level are included in this class. Up until this point there has not been an emphasis placed on breath awareness. However, a new chest opening pose is looked at towards the end of the class which is an ideal position from which to begin observing the breath. Key Poses: Full arm balance preparation, head balance preparation, setu bandha sarvangasana. Since I have been an Iyengar student for several years, I was surprised at how much I learnt during this course. I will repeat the beginners course until I have more flexibility and upper body strength. Thank you Rod for offering these online classses. I’ve completed classes 9 and 10 of Basic Beginner ll and am ready to move on to the Beginner Extension classes. That’s great to hear Kim. Nice one! I hope it’s been helpful for you. If you have questions along the way please don’t hesitate to get in touch.